I became a fan of INJ Culbard's work when he drew The New Deadwardians, one of the last good Vertigo series, and I've always been aware of Ian Edginton's writing, enjoying things like his Hinterkind series, also at Vertigo. 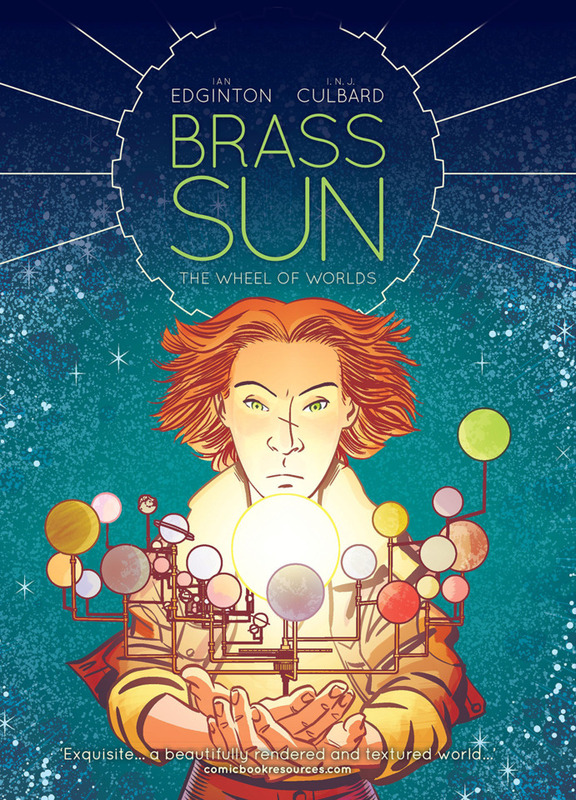 When Titan started publishing Brass Sun as a miniseries, it looked interesting, and then I came across this beautiful oversized hardcover at a good price, and was happy to grab it. 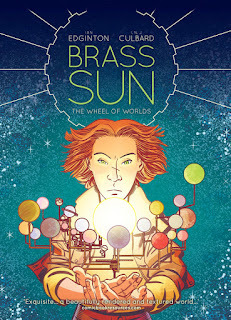 Brass Sun: The Wheel of Worlds is a very interesting piece of work. It's set in a clockwork universe designed and set in motion by a very powerful being, populated with humans. The various planets circle the titular brass sun, which has been slowly losing power, threatening all life. The problem is that a great war broke out between the various planets generations ago, and since it ended, they've been left to develop in isolation, denying even the existence of life in other places. There is a way to fix the sun, using a "key" that has been divided among the different spheres, but the knowledge of it is more or less lost. On one planet, Hind Leg, a young girl named Wren is given the knowledge that her grandfather has been compiling in secret, and when he is arrested and killed, she has to set out to try to save everyone. Along the way, she meets one of the priests who live and toil in the spars between the planets, and he assists her. Together, they begin to travel to the different strange worlds, gaining allies and enemies as they go. INJ Culbard's minimalist art works well here, as he creates strange and interesting cultures, all sharing the clockwork, steampunk aesthetic that the universe was designed with. There's obviously a lot that doesn't make sense here, because the mechanics behind this world are impossible, but it's still a very enjoyable read. The different worlds that Wren passes through feel like they could sustain a number of different stories, and the character work is impressive. I'm always a sucker for an overly developed fictional world, and Edginton has done a wonderful job of building this universe. I was a little disappointed to realize that this is just the beginning of a longer story, but I do see that Volume 2 is supposed to be published this month, although I can't find any actual proof of that having happened yet.